Audiences will receive a history lesson with a goth twist as the Benjamin T. Rome School of Music presents its spring 2018 musical, Bloody Bloody Andrew Jackson. Performances will take place in Ward Recital Hall Feb. 16-25. This comedic, historical rock musical depicts the founding of the Democratic party, while reimagining President Andrew Jackson as an emo rockstar and populist hero. Using modern choreography and costuming, the show will feature a cast of Catholic University students representing every class — freshman, sophomore, junior, and senior. Director Jay Brock, clinical associate professor of acting and directing, notes that the production parallels many issues and recurring arguments present in modern American politics. He says the show demonstrates the University’s ability to explore topics that may be considered uncomfortable. Adapted from a book written by Alex Timbers with music and lyrics written by Michael Friedman, Bloody Bloody Andrew Jackson merges historical fact with fiction to narrate the policies, politics, and personal life of the controversial seventh president of the United States. Bloody Bloody Andrew Jackson was produced in 2007 and made its debut in January 2008 at the Kirk Douglas Theatre in Culver City, California. Later, in 2010, the production moved to Broadway, where it premiered at the Bernard B. Jacobs Theatre. 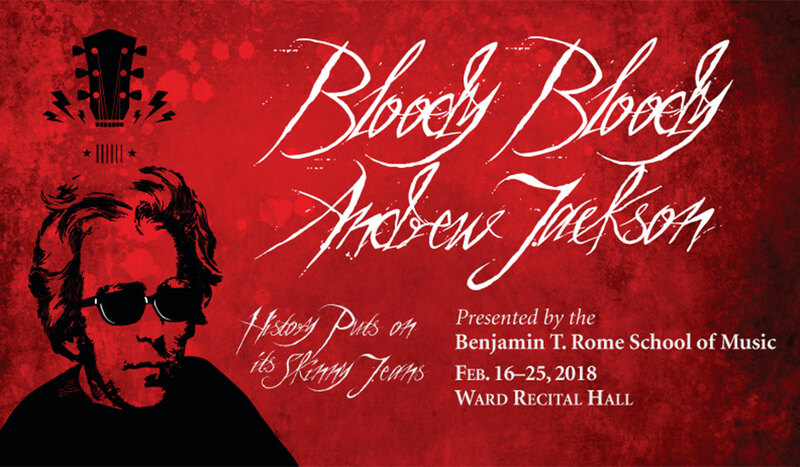 Performances of Bloody Bloody Andrew Jackson will take place in Ward Recital Hall Feb. 16, 17, 22, 23, and 24, at 7:30 p.m., and Feb. 18 and 25, at 2 p.m. Tickets are $20 for adults; $10 for Catholic University faculty/staff/alumni, seniors, and members of the military; $5 for students and those under age 19. Tickets can be purchased here. For more information, call 202-319-5414. Caution: This show contains strong language, adult themes, and is intended for mature audiences only. MEDIA: To schedule an interview or review a performance, contact the Office of Marketing and Communications at communications@cua.edu or 202-319-5600.